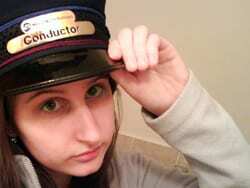 Kids that ride the subway to school, take notice: I have a new excuse for you. Forget the dogs, say the rats ate your homework! These loathed (and sometimes giant!) rodents can be found all around the subways (and you can rate them, too!). Most people want them out of sight, but me, I’m looking for a specific rat. He’s probably long dead, but in his stomach you will find a little bit of history – namely portions of one of my most recent acquisitions. 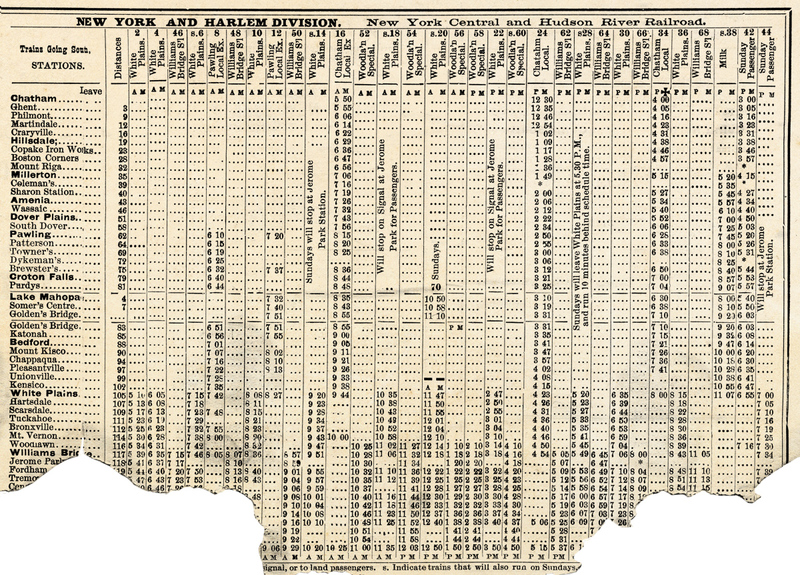 Despite it being munched on, I could not resist the purchase of an 1884 Harlem Division timetable. In all honesty, I have no idea if the damage done was actually caused by a rat. But it does make a nice story! Even if the whole thing isn’t there – some train times are missing, and part of the fare list has been eaten away – I still love this timetable. It does list several old stations that no longer exist, like 86th Street (which is now an emergency exit in the Park Avenue Tunnel), Morrisania, and Kensico. What is left of the fare list is interesting, especially to see the prices and the types of tickets offered. 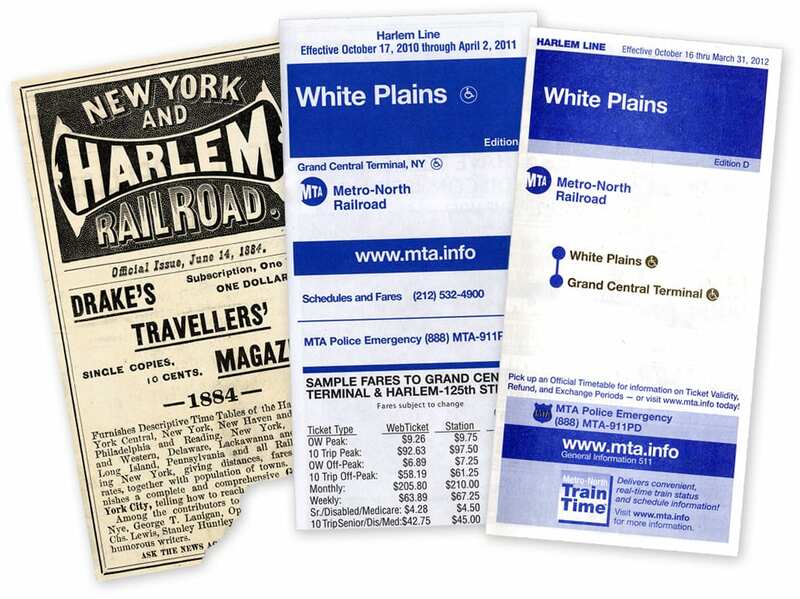 In addition to single rides and round trips (good for 3 days), there were quarterly tickets (good for 3 months), and ticket books for the whole year. 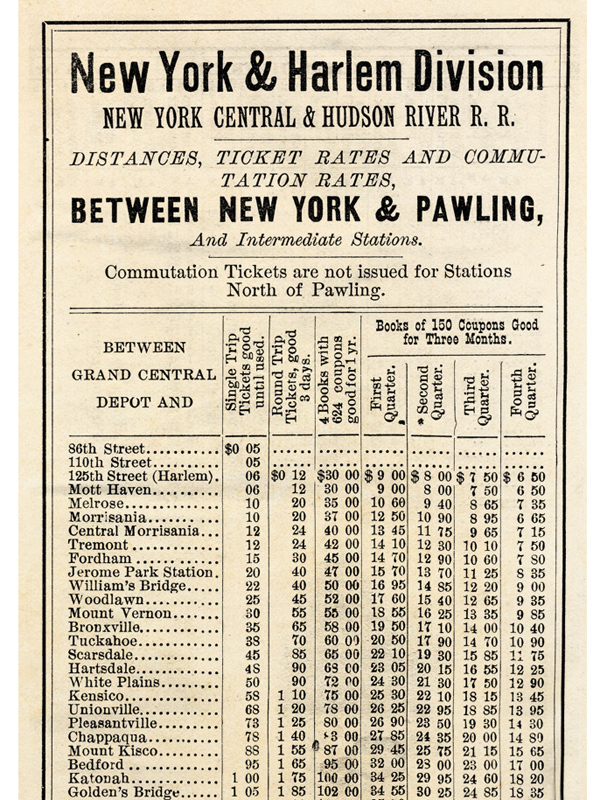 A one-way from Katonah cost $1.00, a round-trip $1.75, and a yearly ticket cost $100 – a savings of $7 from the quarterly tickets (quarterly tickets were cheaper at the end of the year, and most expensive at the beginning). Because I love this timetable so much, I wanted to share it with you all. I scanned the entire thing, though some of the portions are truncated as to not show where the tears were. The timetable portions have been left as-is, without hiding any of the missing pieces, as I felt the information was too valuable, even if you can’t see everything. 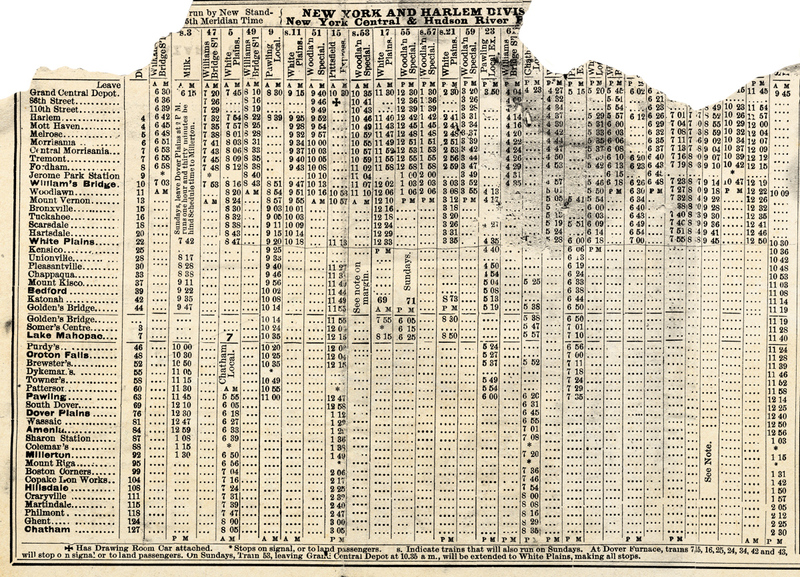 1884 timetable side by side with current local timetables. They are very similar in size. Part of the reason I find this timetable so interesting is because of the old ads found within. I always wonder if any of the establishments still exist, or what happened to them. 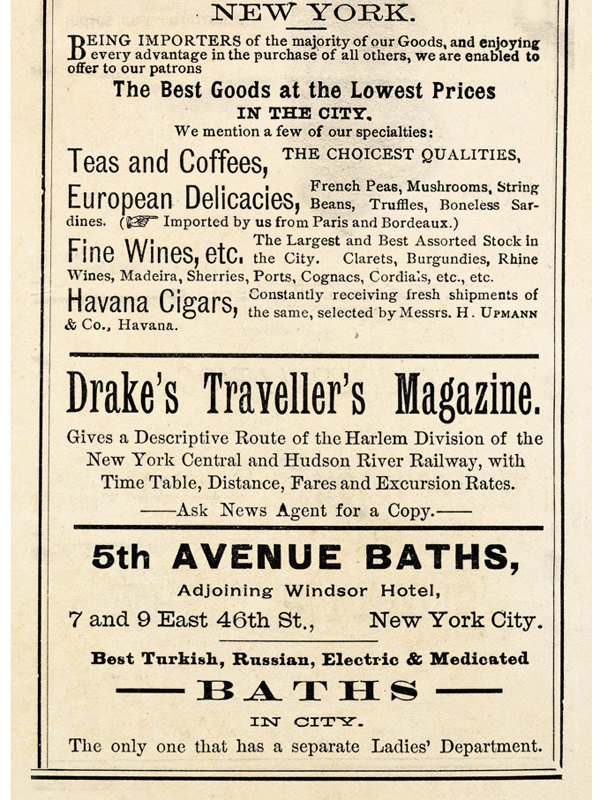 Drake’s Travellers’ Magazine, which is advertised on the front of the timetable was a monthly 40-page magazine established in 1882 by John Drake. 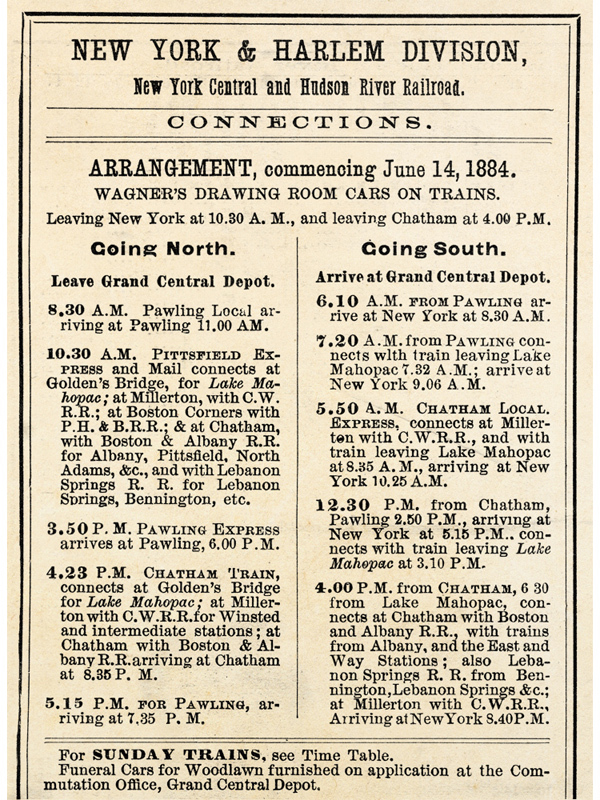 It contained information of the timings of various trains in the northeast, as well as some humor pieces. 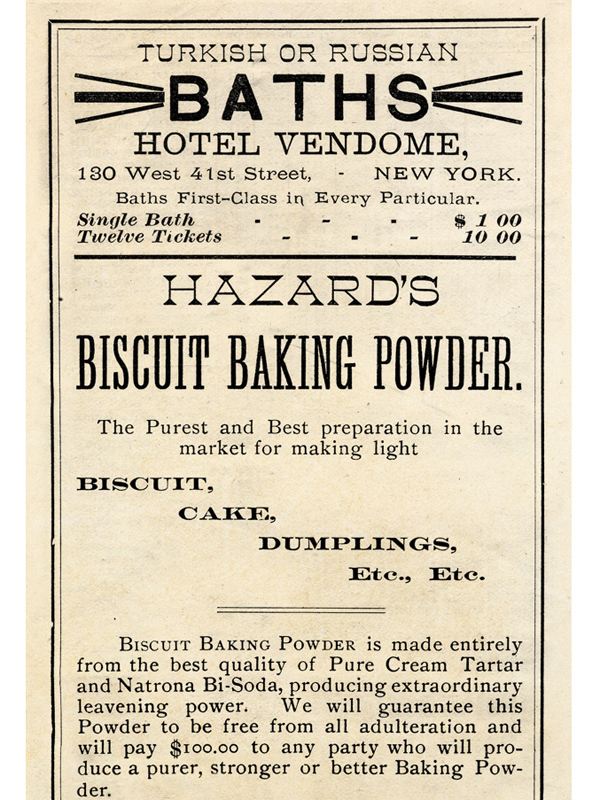 There were several ads for baths in the timetable, though none of them seem to be in existence today. There are still Turkish and Russian baths in the city today, one of which was founded in 1892 – several years after the publication of this timetable. 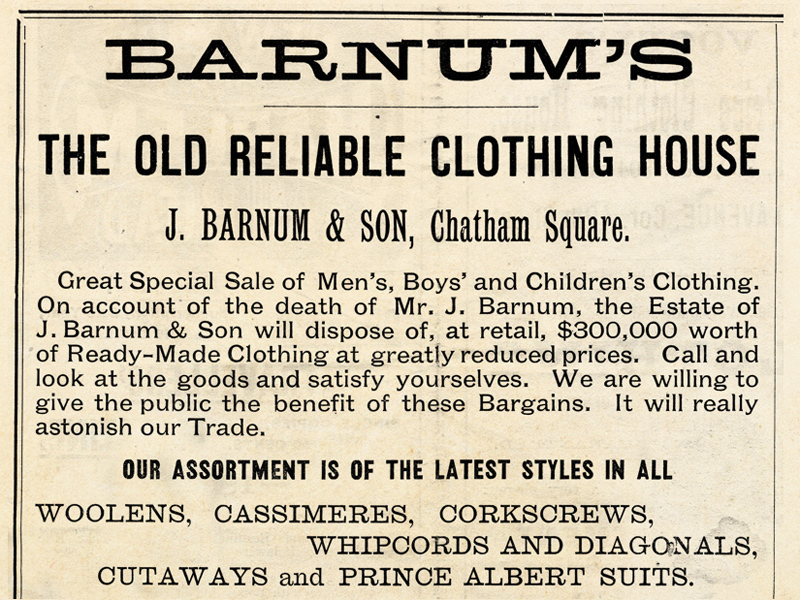 It seems that the Barnums, owners of a large clothing store in Chatham Square advertised in the timetable had a personal interest in the Harlem Division. 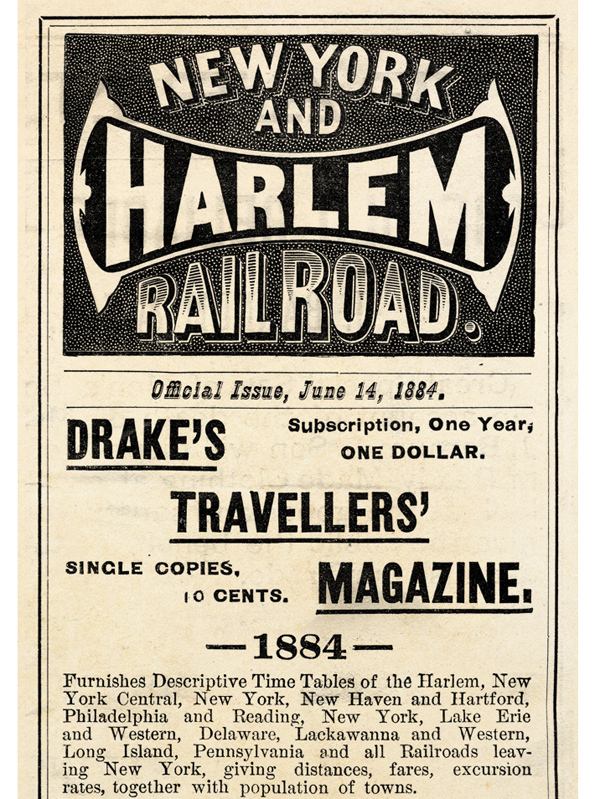 Both Stephen and Joshua Barnum were born in Brewster (or as it was referred to at that time, Brewster’s) and were certainly riders of the Harlem. 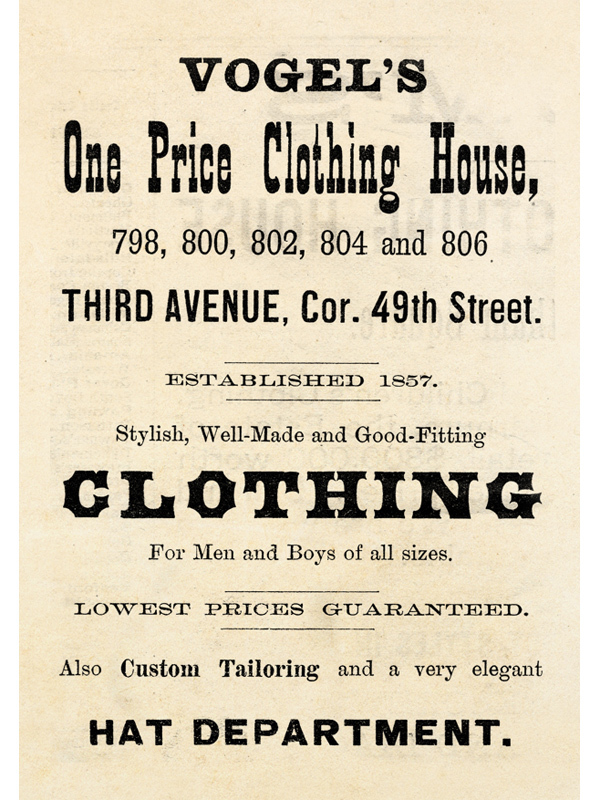 Otto Maurer, whose ad here is probably my favorite, started up his business in 1872 in the basement of a five-story tenement building. Not only did he sell magical equipment, he also repaired broken equipment, and taught magic lessons (in four languages!). 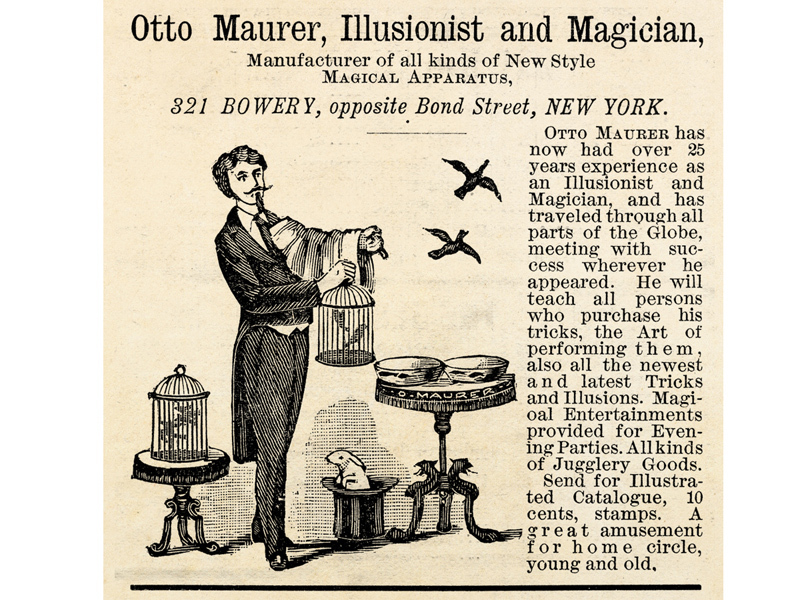 Maurer died in 1900 (his obituary in the NY Times called him the “King of Magic”), and the shop was finally closed in 1903. 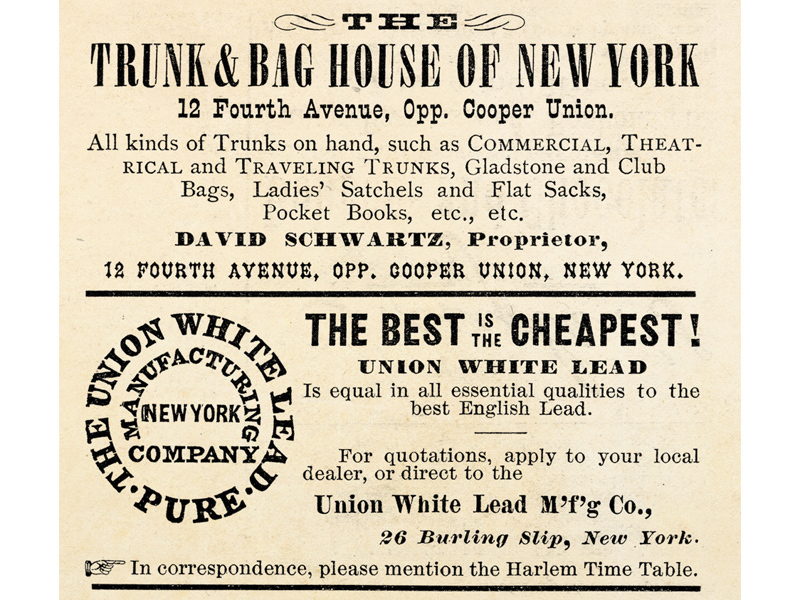 The Union White Lead Manufacturing Company, which also advertised here (though it does seem like a strange thing to advertise in a timetable), was organized in 1828. Their complex in Brooklyn covered over twenty-three city lots, and could produce around 3,000 tons of lead per year. Although the lead smelting operation there ceased in 1904 (and the buildings demolished), the surrounding soil is contaminated with lead even today. 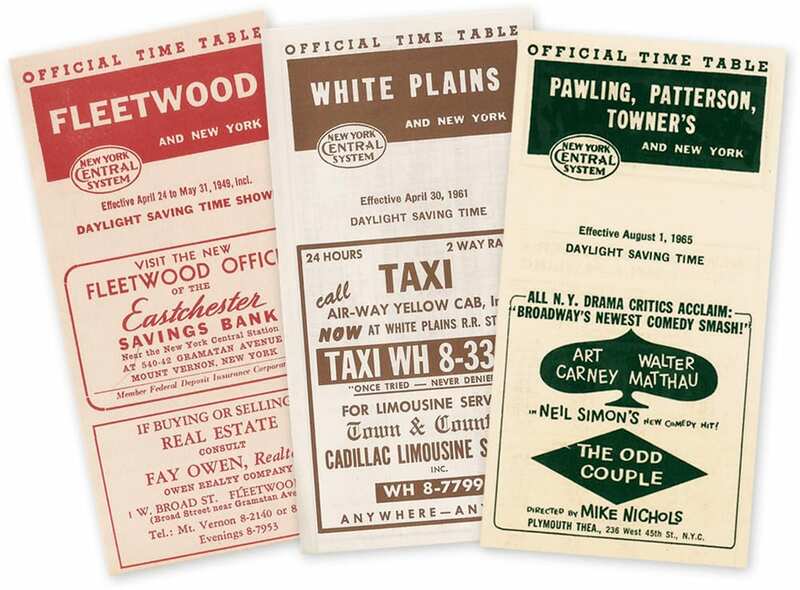 Examples of other local timetables with advertisements, dated 1949, 1961, and 1965. City attractions and shows, as well as local taxi services seem to be the norm in later timetable advertising. Maybe it was a ‘possum what et your timetable. Some of the stations listed that were closed lasted until the 60’s and some until the early 70’s. 138th st (Mott Haven), Morissania, and Central Morrisania were closed due to the platforms being too short for most trains to stop there, you can still see the cuts in the walls of the cut south of the Fordham station. Of course the upper Harlem was closed in the middle of a weekday in the early 70’s due to a PC budget issues and declining ridership. But you’ve see all that here. What was really a treat, all of those stations had beautifully built station houses above the tracks. Most of those lasted until the 70’s and the Bronx being what it was then as well as the agencies owning those structures not wanting to maintain those, took them down in the late 70’s early 80’s. Only Fordham station “house” still stands. 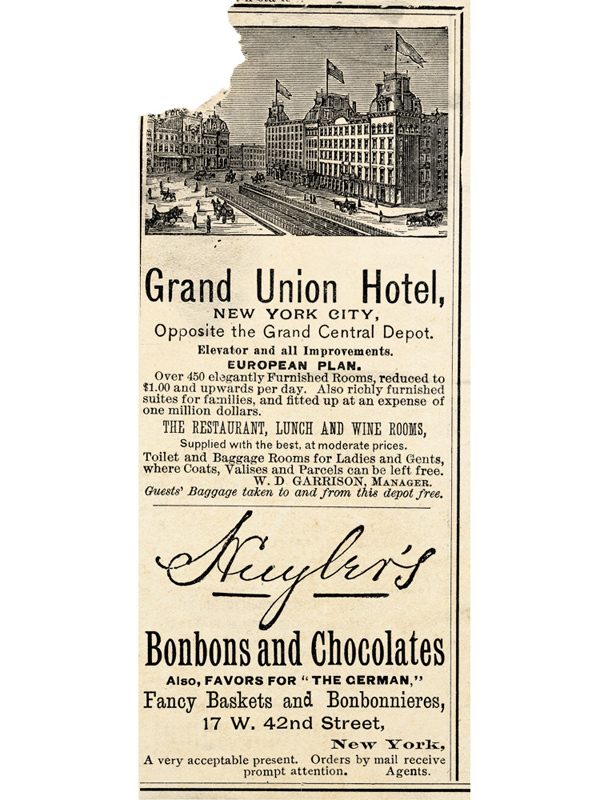 The ads in old timetables are a great reminder of what once was in the NYC area. Especially on the smaller local timetables. Great Work!!!! 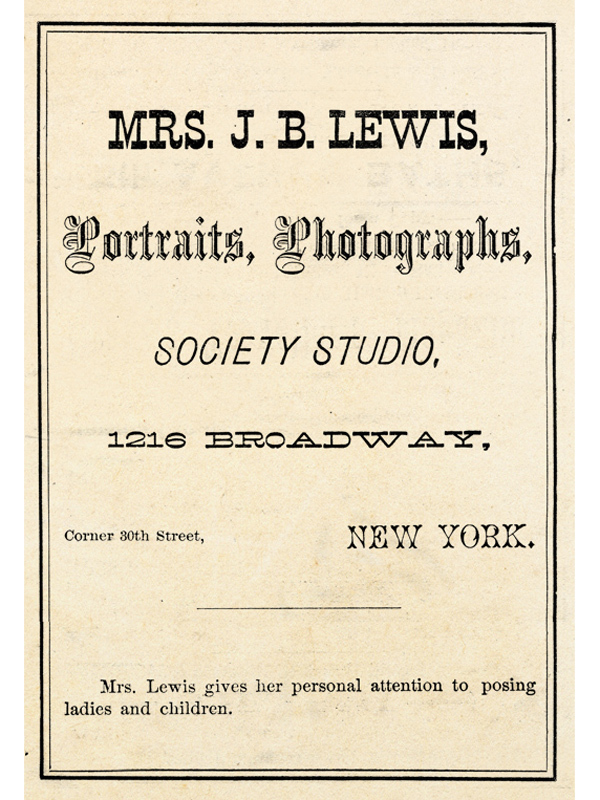 2 hours from GCT to Brewster’s — I’m impressed, though service was pretty good in those days. When a corner(s) is chewed, typically the item was in a bundle or stack (CSI: Metro North). One always wonders what else was in the pile.